The Recording Feature is available to an additional monthly storage fee, allowing sessions to be recorded by account holders with a Windows or Mac computer. (Participants can be on smart phones or tablets, but session hosts must be on a computer.) To request a quote to enable recording, or to disable recording on your account, please contact our Sales Team at [email protected] . 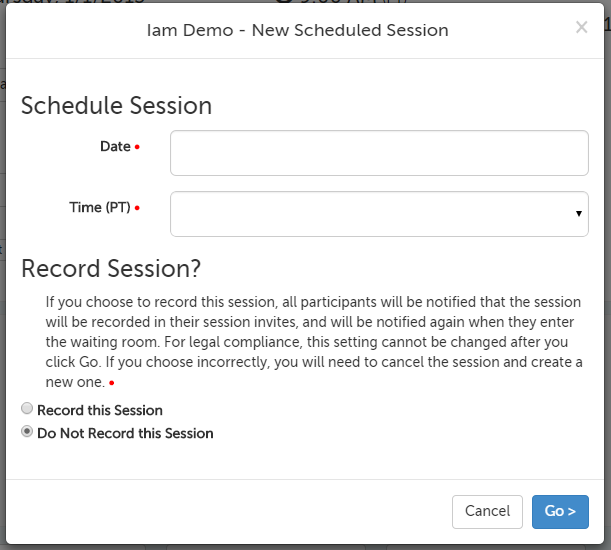 This support article illustrates how to schedule a recorded session on a VSee-platform account with recording enabled. 1. Click on the "Videoconference" tab. 2. Use the "New Session Now" or "New Scheduled Session" button to create a new session. 3. The first message that appears will ask the user to choose if the session will be recorded or not (defaults to "Do Not Record this Session"). This example uses "New Scheduled Session." The prompt for a "New Session Now" would not ask for the date/time. For security purposes, once the session has been created, you will not be able to deselect the recording option. If you need to change it, you will have to cancel the session, create a new one, and select "Do not record this session." 4. Invitations to participants will include notices that the session will be recorded. A note will also be visible to participants on the waiting room page, and to hosts on their Dashboard. This article was last reviewed by our Support team on May 1, 2017.